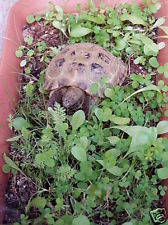 This can be fed to all kinds of tortoises once grown. Simply plant in soil and lightly water. Sprinkle limestone flour over offered food.